One of the best parts about travelling is discovering unusual places or getting out of your comfort zone. Bali has this in spades. Plus it’s one of the most affordable destinations for South Africans, meaning many of these hair-raising and off-the-beaten-track activities won’t break the bank. 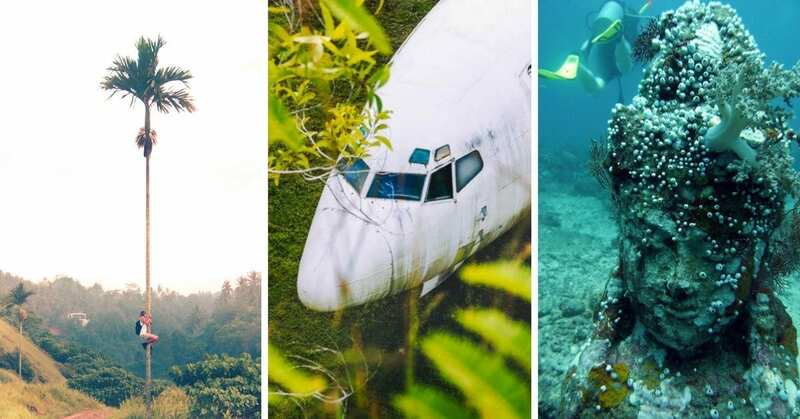 From abandoned aeroplanes to hiking active volcanoes, here are some of the best unusual and adventurous things to add to your things to in Bali list. PLANNING A TRIP TO UBUD? 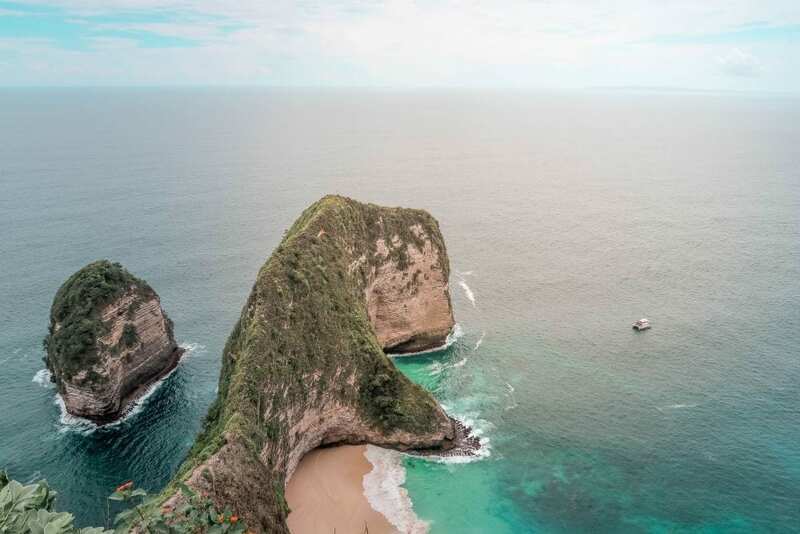 A day trip to Nusa Penida is one of the best adventurous things to do in Bali. The island is home to beautiful villas, lush forests, mystical temples and jaw-dropping scenery. Its prize jewel is Kelingking Beach. You’ve probably seen this Tyrannosaurus Rex cliff shape all over Instagram. But did you know that it’s possible to get down to this secluded beach? The pathway is treacherous and should not be attempted by the faint of heart. You’ll need to move slowly and carefully, as there is often no rail preventing you from falling off the edge. After a hair-raising hike, you’ll finally make it down to one of Indonesia’s most beautiful beaches. The water is crystal clear, the waves are gentle, and there’s more than enough pristine beach to work on your tan and take in the scenery. An organised day trip from Ubud to the island costs around IDR 400, 000 ( R200.00) and includes hotel pick up and return ferry tickets. Top Tip: If you can, make your own way to Kelingking Beach instead of using an organised tour. You can take your time walking around to the different viewpoints and attempt the hike without having to watch the clock. Built in 1946, Tirta Gangga is a serene hillside retreat. 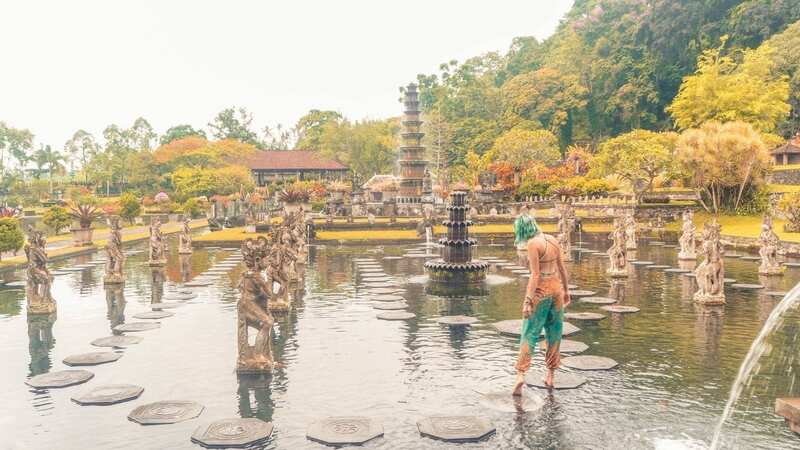 Located on the south-eastern slope of Mount Agung, its full of tropical gardens, spring-fed pools with stepping stones and ornate statues. If you can, get here as soon as the gardens open in the morning. You’ll have the entire place to yourself and can enjoy the tranquillity before the masses arrive. The entrance fee is IDR 30,000 ( R27.00) for foreigners, and there are a few nearby restaurants you can stop at for breakfast afterwards. Lempuyang Temple is one of the most sacred temples in Bali. Located in the east, it’s not the easiest temple to visit and is also one of the most physically demanding. From the parking lot, you’ll climb 1,700 steps and pass various temples and shrines as you make your way to the top. Keep an eye out for curious monkeys and don’t forget to turn around to take in the view of Mount Agung in the distance. It’s what makes this temple one of the top things to do in Bali. If you don’t have 2 hours of temple trekking, walk to the first temple gate. 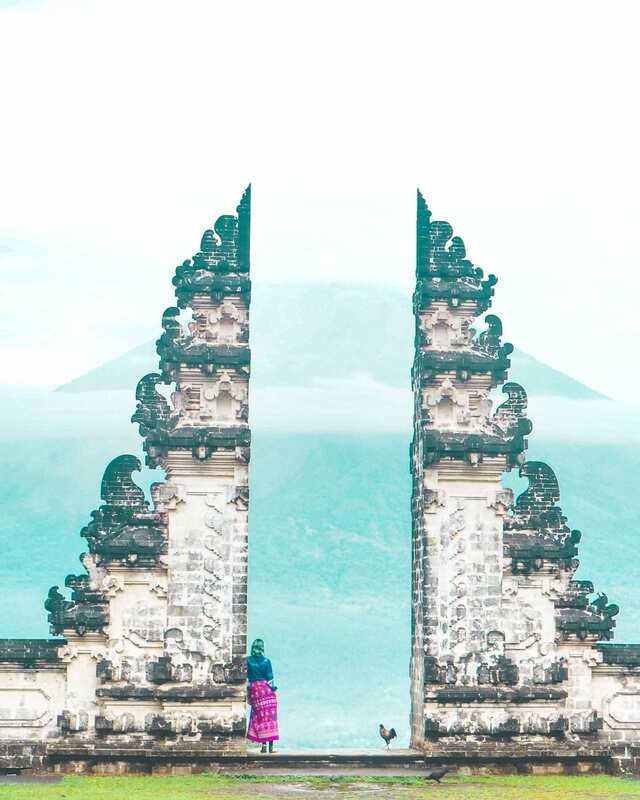 You’ll still be able to see Mount Agung and get that classic picture of the temple gates without the workout. There is no set entrance fee, but you will be asked to make a small donation. Top Tip: Dress codes at Lempuyang Temple are strict. Please respect the Balinese temple by covering your shoulders, neckline and knees. You’ll also need to hire a traditional temple sarong for IDR 10,000 (R 9.00) to wear while you’re on the premises. I’m not a morning person at all, but I’ll push past my hatred of alarm clocks to hike an active volcano for sunrise. The mountain is considered one of the most sacred by the locals, and it overlooks one of Bali’s largest lakes. It’s possible to do the hike with an organised tour or to do it yourself. The path is clearly marked so you won’t have trouble finding you’re up to the summit. But be warned, the walk to the top is steep and you’ll only have your torchlight to guide your way. 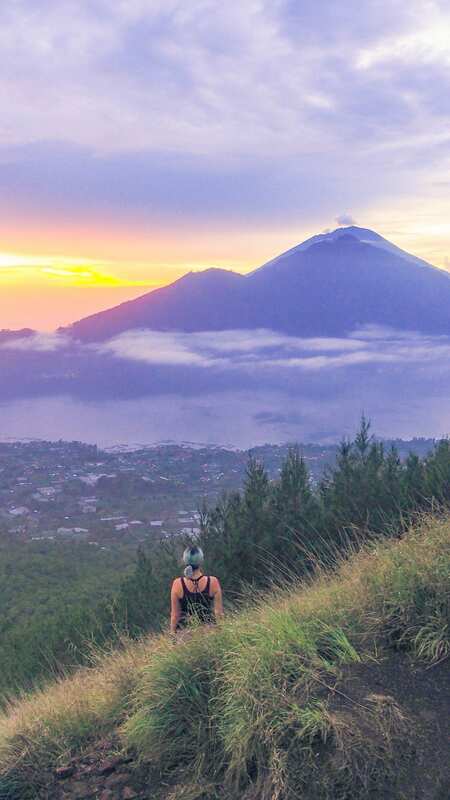 Once there, pick a spot and watch the sun rise over Mount Agung and the surrounding landscape. Coffee, tea and a simple breakfast of banana sandwiches will also be waiting for you at the top. Bali has an almost endless supply of waterfalls. I spent an entire day on a waterfall tour with a group of digital nomads I met in Bali and we ended up just spending a good few hours at Aling Aling. Well, the weather did rain us out, but we still ended up having so much fun. Sliding down the smaller Kroya waterfall. Jumping off the top of other nearby waterfalls. But standing next to Aling Aling’s 35-meter drop during a torrential downpour still stole the show. 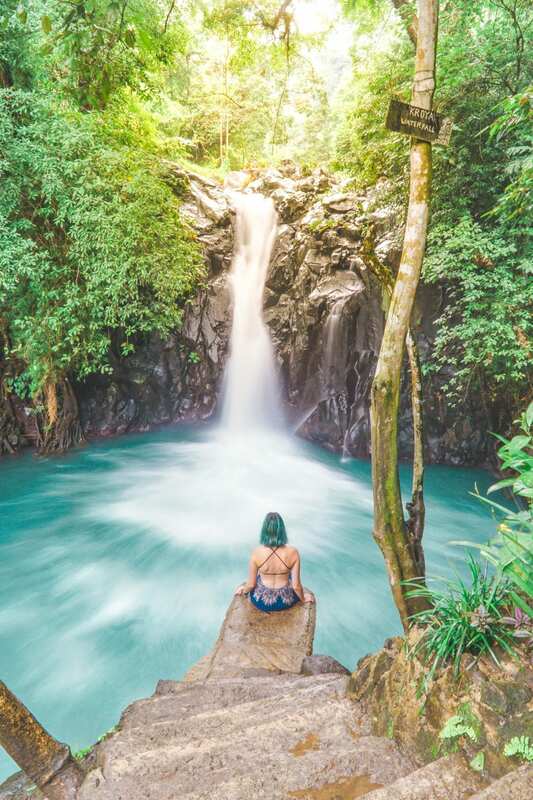 With so many waterfalls to choose from, Aling Aling is one of the best adventurous things to do in Bali – especially if you love an adrenaline rush. Okay, so the Bali Swings is by no means one of the most unusual things to do in Bali, but it is adventurous. While USD 33 is a steep entrance fee, especially for South Africans, but it does go a long way. The price includes access to all the activities as well as the famous “love nest”. There are five swings to choose from as well as one with a massive drop for the adrenaline junkies. Plus you’ll have access to the open bar and a delicious Balinese buffet. What sold me on Bali Swings, is that a large portion of the profit goes back to the local community. If you have a moment, spend some time chatting with the owner. You’ll learn all about how Bali Swings is helping the vision impaired, supporting local schools and giving back in any way that they can. 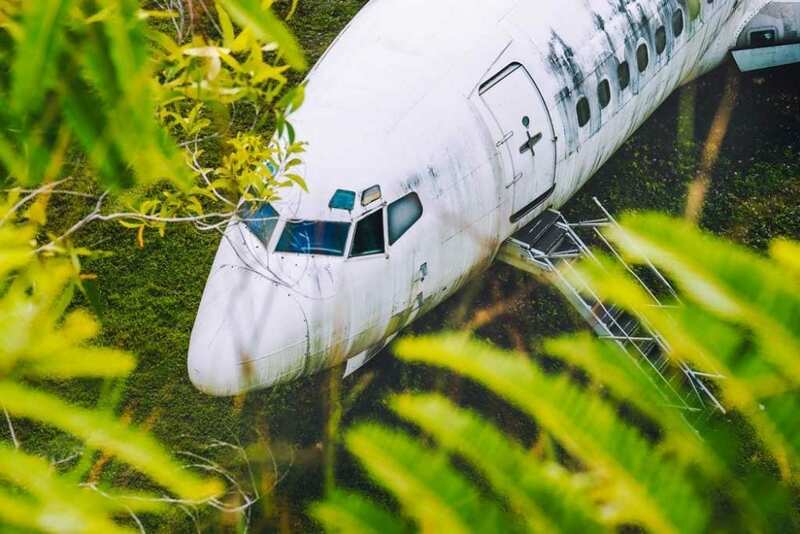 If you want to discover some of Bali’s more unusual places, add it’s abandoned aeroplane collection to your bucket list. Located in Kuta about 500m from Benoa Square and is right next to a Dunkin’ Donuts. Located on top of the abandoned Gate 88 Mall, you can explore two eerie attractions at once. Located only 5minutes away from Pandawa beach, this is the most accessible and popular abandoned plane to visit. But it is on private property, so you can’t get too close. I mean, where else in the world can you swim past statues of Buddha and other Hindu Gods and Goddesses? 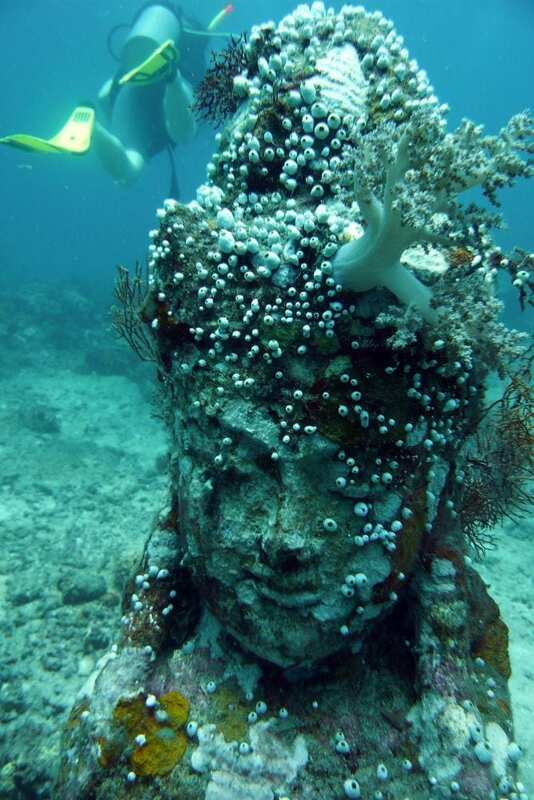 Located on the island of Nusa Lembongan, the Pemuteran Temple Garden is one of the most unique things to do in Bali. Whether you’ve got your diving qualification or just want to snorkel, you’ll be able to explore this submerged temple garden. While you can join an organised day trip, it is the more expensive option. Try to find a local guide that will take you, and you’ll get a better price, and have a less crowded experience. Which of these unusual and adventurous things to do in Bali will you be adding to your bucket list? 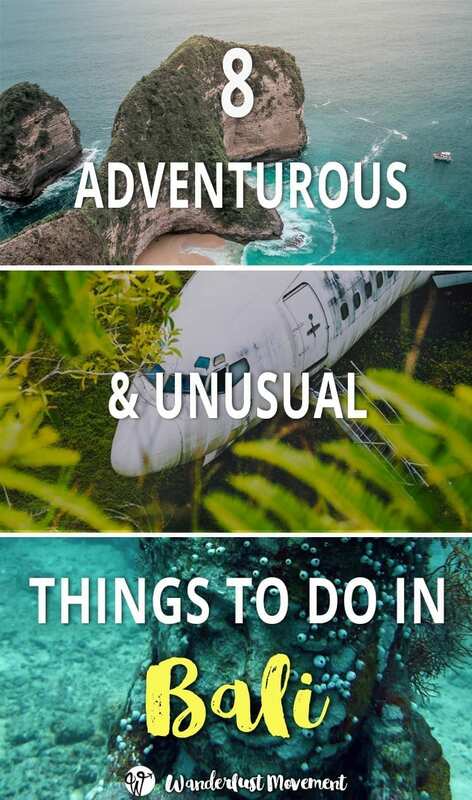 Get the FREE Budget Ubud, Bali Travel Guide with all of my tips and recommendations in a conveniently printable PDF download. Success! Check your email to download your Ubud, Bali travel guide!